We were on board an Italian research vessel owned by Tethys Research Institute, which had departed from Portosole, Sanremo, early on the 15th June 2017. The Pelagos, owned by Tethy's Research Institute. This not-for-profit was set up by marine scientist Giuseppe Notarbartolo di Sciara in the 1990s. In just two days, we were due to meet Prince Albert II of Monaco out on the high seas in the Pelagos Sanctuary in the Mediterranean Sea. Our plan was to film the Prince with the whales and dolphins, since his family helped to save these creatures back in the 90s. This story of the Pelagos Sanctuary begins with an Italian scientist named Giuseppe Notarbartolo di Sciara. He had grown up sailing around the Mediterranean, and had fallen in love with its wildlife at a young age. He was living at a time when the dolphins and whales were being tangled in drift nets of fishermen, and they were dying - a pointless death. So, Giuseppe decided to do something about it, and what happened next makes for a great fable. Giuseppe approached Prince Albert II’s father, Prince Rainier of Monaco, to ask him to help initiate talks with France and Italy to create the first international marine sanctuary out on the high seas. It is was a bold thing to do, but Giuseppe felt compelled to do it. Essentially, this prince granted the wish of an ordinary person, like you and I, to come true. The Prince listened, he felt moved by the cause, and so he acted. (It’s not a story about leadership you hear about everyday). At that time, Giuseppe says people around him told him that his idea was a ‘stupid idea’ and that it would never happen - well, did he ever prove his critics wrong. Coming back to June 2017, we are out on the Mediterranean, and we are filming this real-life fairytale of the Pelagos Sanctuary, and it feels magical, like we have stepped back into the days of our childhood where you feel and believe in a happy ending for humankind. I honestly had to pinch myself as I sat up on the deck, scanning the ocean for the blow of a whale. On so many levels, the story of the Pelagos had struck my artistic sensibilities as one of the most special stories I knew we’d ever tell. It was a story about the triumph of goodwill, good leadership and good-natured souls. It was a story that shows how everyday persons with a big dream for a better world can make their dream come true - if we truly believe and work hard for it. It wasn’t a dream that came true over night; it was something that took years to do, but it happened. After departing Sanremo, we had a sighting of striped dolphins. Now, today, we are recording that story. Our plan is for our research vessel to set sail to meet Giuseppe and the Prince at 8:30 AM on the 17th June. Giuseppe and the Prince would find us by radio, and would meet us out at sea. (Giuseppe had helped to establish this research vessel long ago, but he wasn’t able to join us for the start of our trip). In the lead up to this big day, we would spend a couple of days searching for dolphins and whales to get some additional vision for the 'Prince and Giuseppe' story - but we were anxious. Our plans could go astray, if the weather and the swell remained the way it now was. Even on a calm day, it is difficult to film the giants of the sea. 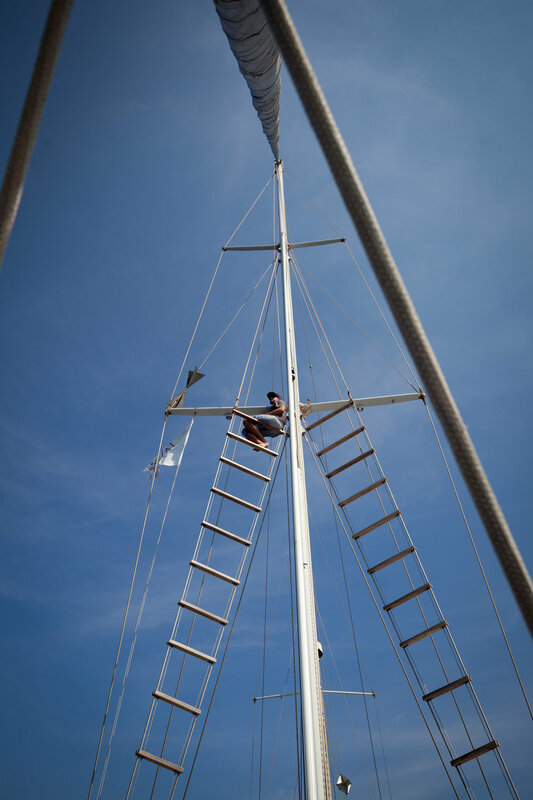 Tethy's Principal Field Investigator, Alessia Scuderi, straps up Co-Director, James Sherwood, so he can climb up the mast and look out for fin whales. Co-Director, James Sherwood, on the look out for fin whales. With the darkening sky, visibility was declining, which meant it was getting more and more difficult to try and spot a whale spurt. We would have just one day with the Prince, one day that had been penciled into the Prince’s diary about ten months ago - just one day to get everything right, or it meant that our entire documentary project might fail. The Prince was central to our story, and so were the dolphins and whales - probably three of the most elusive worldly subjects in terms of trying to capture them on film. The loss of time, digging deep into our energy reserves, while we stressed over not being able to secure a normal income, on top of the money invested into this trip, was getting to me. This was a big project for two small-time filmmakers from Australia. That is why I had been sleeping badly, tossing and turning for at least a few weeks - and, sometimes, not sleeping at all. However, despite the strangeness of the orange sky, and all those ghosts inside my head, feeling the hangover of a recent string of obstacles to getting this filming finished (like losing our underwater housing in the Solomon Islands - see 'The Blood Moon' story), and the prediction that perhaps conditions on this trip were changing for the worse, I still felt such a burst of anticipation and excitement that somehow I just knew events were going to change for the better. I just had to push through. Our friends, family and strangers had contributed to the filming of this documentary with our Kickstarter campaign, and we did not want to let them or our sponsors down. Yet, there was something more than that which was keeping me alert. Strangely enough I felt the same way as I did when we were in Antarctica - something extraordinary was about happen, but I wasn’t sure what. Sometimes, you can just feel it in your veins, and you don’t know why - you just feel it - and it was this particular feeling that I was clinging onto in the months leading up to these days out to sea, that kept me going and helped me to get through those days when I was dreary from lack of sleep. Perhaps, this is the reason I found it difficult to keep still or at least keep my eyes from wandering, constantly moving around the ship, scanning the coastline, trying to spot a whale or a dolphin. I could not lift my eyes from the skyline. If I missed just a splash, it could mean that we would end this journey without any vision of whales at all to go with the Prince’s story. (Palo, the captain of the ship, would later tell me that they have had filmmakers come on board for ten days, and return with nothing when it came to whales, so the pressure was on). Striped dolphins playing in the Pelagos Sanctuary in the Mediterranean Sea. Earlier that morning, we were fortunate to film some shots of dolphins playing in the wake of the boat, so at least we had something to work with - but we needed much more than this to create an epic scene for The Map to Paradise (film). Then, the weather changed again. The shadows, which still lay upon the seas from the clouds on the horizon, made it difficult to spot a whale. That optimistic feeling, however, persisted inside of me. Although I felt anxious, I felt everything would be just fine. Eventually, by the afternoon, the clouds began to evaporate and the seas began to calm and turn into glass. (It could have been the same glassy sea with the pink hue of the setting sun we saw in Antarctica earlier in the year). Something special was about to happen. I could feel it. And there it was, the spurt of a fin whale in the distance. 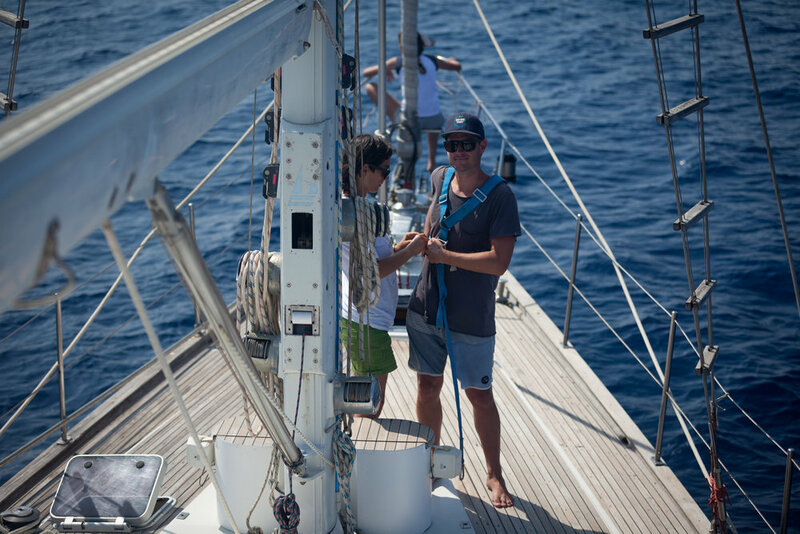 Co-Director James Sherwood and Principal Field Investigator, Alessia Scuderi filming and photographing wildlife out in the Pelagos Sanctuary in the Mediterranean Sea. As the boat neared towards the whale, another was spotted and then another. We filmed the whales for some time on the surface, but James and I knew that more had to be done to make this story look spectacular - James had to hop into the water with the fin whales, if we were going to make this shoot work. 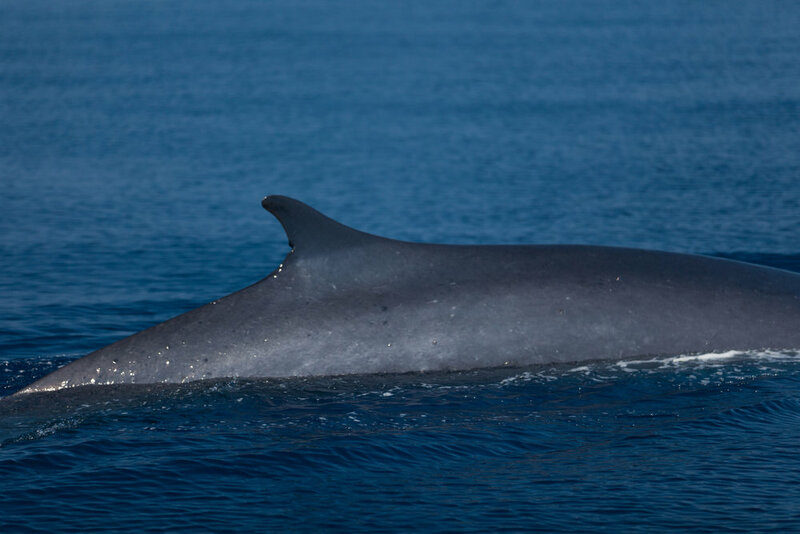 Fin whales are the second largest whale on Earth. They do not play on the surface like a humpback whale does, and neither do they show off their fluke or breach as often. These whales would show their hump about four times to take a deep breath, and then would dive deep below. This meant that what we were about to do was going to be hard - really hard to do. We piled into a zodiac vessel that we had hired and sped after one of the whales. The boat captain, Simone Panigada, was quick to react to the activity on the surface. We drove alongside this beautiful giant, ready to drop James in the water so he could free dive and take an underwater image. However, we arrived just as it took its last breaths before disappearing into the deepest depths, leaving just a gentle ripple in its wake. To get an underwater shot of a fin whale is particularly challenging because they do not necessarily travel in a straight line. You have to constantly scan the waters, trying to guess where it will come up. And, if your boat is drifting the other way, then you have to try and speed as quickly as you can towards the whale when its hump emerges again. Eventually, we managed to position ourselves correctly and James jumped in, but the whale submerged. Co-Director James Sherwood swimming out on the high seas in the Pelagos Sanctuary. If you look closely, you can see a cargo ship in the distance. We tried again, but the same thing happened. It took some persistence, but finally James got the shot. Can you imagine seeing a giant about 20 meters long swimming beneath you, and you are the only one to see it? I closed my eyes for a brief moment and imagined what it must have been like for James to experience that moment. The dorsal fin of a fin whale up close. When James surfaced, I could see that his eyes were lit with an addiction to the Mediterranean blue and to chasing whales. I wasn’t at all surprised when James told me that he wanted a better shot. If that is what he needed, then we just had to get it. The race was on. Never before had I been so conscious of time. I felt the time ticking down inside my head. I knew we were running out of time. We were working with a wild creature, which could disappear and never show herself again. We had to seize this filming opportunity while it lasted. If we got the shot, it would turn out to be one of the most important shots in the documentary.